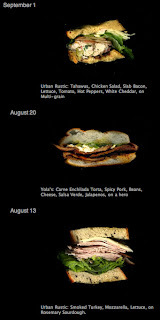 manámaná: A sandwich for all: Scanwiches, the guide for choosing wisely! A sandwich for all: Scanwiches, the guide for choosing wisely! Reading 37signals' blog "Signal vs. Noise", which I recommend everybody, even if you don't work in the software industry, I've stumbled upon a wonderfully simply but nice and useful blog called Scanwiches. The idea is as simple as appealing: A photo list with the sandwiches someone is cooking and/or eating and their ingredients, updated as time goes by. The photos are great, the style of the blog is simple and stylish, and the sandwiches are... well, having a look at them and start craving is all one!